Another early taste of winter is in store for the Northeast by the end of this week, just in time for the Thanksgiving holiday. 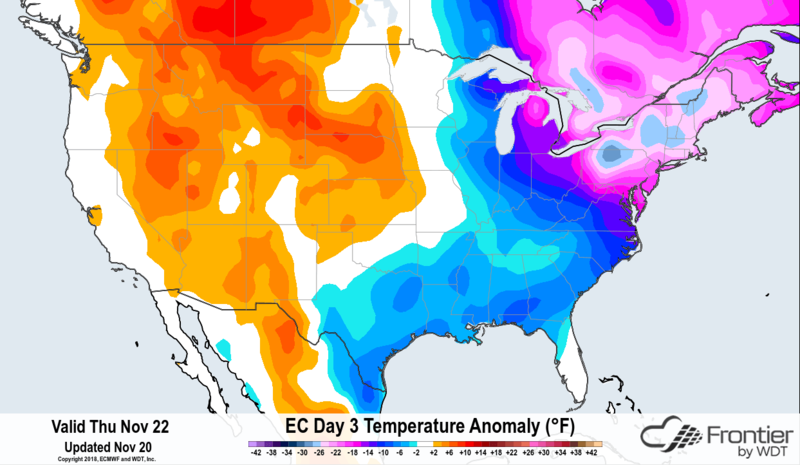 Both the GFS and ECMWF weather models are predicting temperatures to plummet as much as 25-30 degrees below normal, particularly in interior parts of the Northeast, as an arctic air mass plunges south out of Canada. Forecast highs will struggle to reach 20 degrees in many locations and temperatures will dive into the single digits, even below zero, throughout the interior Thursday and Friday morning. As an example, the Frontier Weather forecast high in Syracuse, NY is 19 degrees on Thursday with a low of 7 the following morning. Some of the weather models are predicting even colder conditions with highs in the low teens and lows below zero. 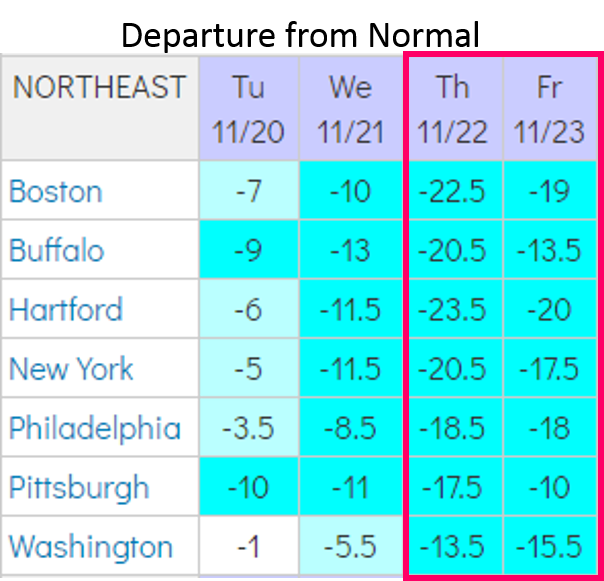 Even the big cities will not escape this arctic cold blast for the holiday as Boston, and New York will experience one of their coldest Thanksgivings ever. 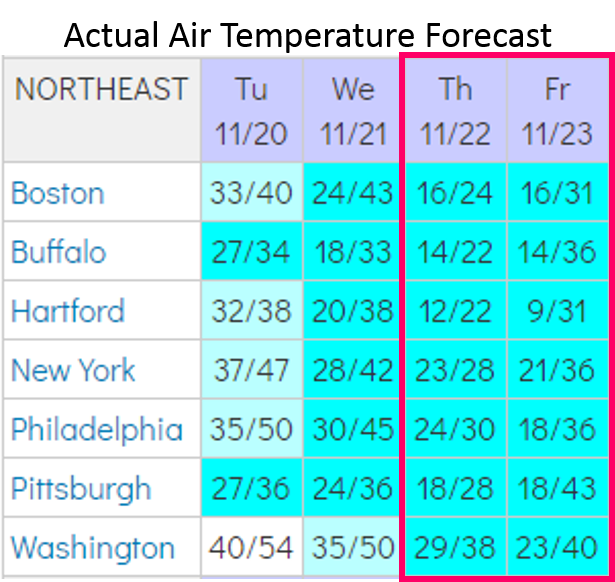 Boston will not make it out of the 20s on Thanksgiving Day, with lows in the teens, while the Big Apple will struggle to reach the 30-degree mark. 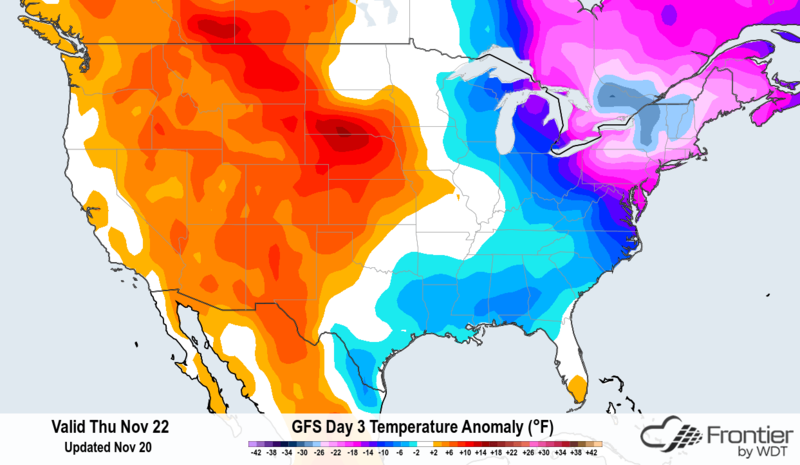 These temperatures range from 15-20+ degrees below normal with more extreme cold inland. Temperatures will moderate into the weekend and early next week before another shot of cold air pushes south and eastward from Canada by the time we move into early December.